The Renault Lodgy Stepway is a spacious car with massive boot space which can seat four comfortably (with the 3rd row folded down). Essentially, it’s the perfect car to lug around our production crew along with all their equipment for shoots. While that’s a more common occurrence, I also use it as my daily driver where it encounters mall parking, weekend outings and office commutes. We’ll tackle the work part in this report. In our recent comparison with other 6/7 seaters, the Lodgy Stepway was the most comfortable MPV for occupants in the 3rd row. While that’s rarely how our LT gets used for work trips, the Lodgy Stepway does well in the space department. With the 3rd row perennially folded flat, the 1861-litre boot is sufficient for all my video equipment. While removing the 3rd row of seats is an option, we let it be, just in case there were more than four people travelling in the car. The Lodgy handled all road conditions without breaking a sweat. From the bumpy patches of the Expressway to the broken roads of Mushi/Tamhini, it didn’t need to be nursed when the roads got worse; thudding only when you carry too much speed over bigger potholes. Cubby holes, stowages and bottle holders are aplenty. Each row also gets a 12V socket which came handy for charging batteries on shoots. However, relatively taller second-row occupants complained about the legroom as the seats don’t slide back. But thanks to the huge glass area, coupled with the light beige upholstery, the cabin feels airy. The beige leather upholstery though is slightly difficult to maintain as it gets soiled easily. Does it fit in 2019? Well, it does get a 7-inch touchscreen and 4-speaker system which sounds quite good, but an old-school, laggy UI prevented me from using the onboard navigation system. On the upside, the reversing camera performed pretty well even in low light conditions. That said, every time the car was started, it took 8-12 seconds to initialize. This was especially annoying while starting up the car and backing it up in a hurry. I have really grown fond of the odd Bluetooth telephone controls behind the steering wheel. Bluetooth connectivity itself, however, is a hit and miss affair but works in most conditions. Three years and over 16000km later, a fair amount of squeaks and rattles can be heard inside the car. For starters, the driver seat rocks back and forth on heavy braking and the third-row seats rattle when folded up. Even the plastic panels on the rear windshield rattle against the glass panel (which had to be fixed with a folded piece of paper). This intensifies when driven over a bad patch of road. But the dark panels on the inside have handled the torture of time pretty well and don’t look as bad as beige plastics would have. But thanks to its rough wood-like texture at some places, they’ve collected quite a bit of dirt. The 110PS and 245Nm of torque from the 1.5L diesel engine is ideal for cruising. Due to the lack of low-end grunt, I found myself shifting to first quite often. Dial in the slightly heavy clutch and bumper to bumper traffic becomes a tiring affair. But over 2000rpm, there’s enough grunt to manage quick overtakes. 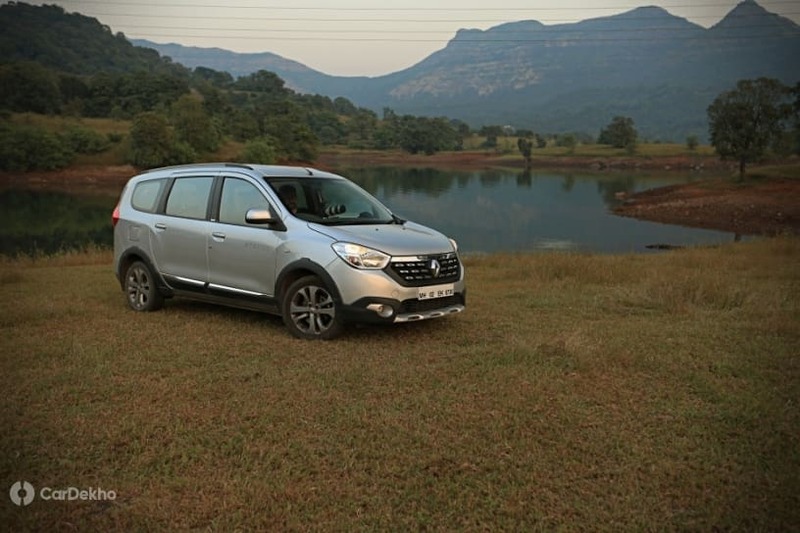 The Lodgy Stepway drives and handles like a car thanks to a suspension setup which is slightly set on the firmer side. It also holds its composure quite well when driving over rumble strips unlike most cars of its size. Body roll while still evident, is quite controlled for a car of this size and kind. Sneers: Rattles in the cabin, low end pull form the engine.